Can you switch between palm rolling and interlocking? This is a great question, especially if you are someone that has an active lifestyle, thinning roots, or desire firmer locs! The short answer, when switching between palm rolling and interlocking, is that it is possible— with caution and care. However, it is important to understand the purpose of each technique to decide if switching between palm rolling and interlocking is a good option for you. The purpose of palm rolling is to use the palm of your hands to manipulate the loose hairs at and around the root toward and into the shaft of the locs. Essentially, with palm rolling the hair is “doing the work” of locking over a period of time. 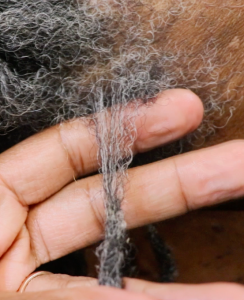 Whereas, with interlocking the purpose is to intertwine the loose hairs at the root to resemble the internal structure of the shaft of the locs. 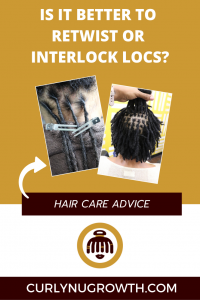 Essentially, the process of interlocking weaves the loose hair together by bringing the end of the loc to the root. You can think of palm rolling as forming the outside of the locs and all of your shed hair accumulates into that structure. 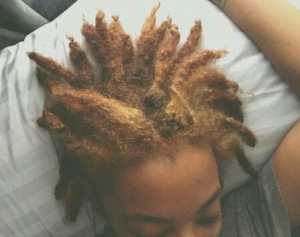 Alternatively, interlocking forms the inside of the locs and your shed hair builds in and around that structure. The interlocking technique is very appealing to most individuals for three main reasons. 1. Active Lifestyle. If you’re constantly working out or swimming, interlocking would be an ideal technique to use because it allows you to shampoo your hair and cleanse your scalp more often with minimal unraveling or stray hairs. 2. Thinning Locs. 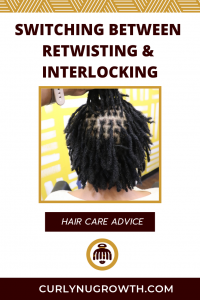 If you’re experiencing thinning at the roots, when performed correctly, interlocking will help to reinforce the hairs together and minimize the possibility of breakage. 3. Loose / Soft Hair. With fine and wavy textures, the process of locking takes longer, but with interlocking you can help the hair stay in place, stimulate the locking process, and produce a firmer loc. These are all good reasons to consider switching between the two different hair locking techniques. However, you should also consider the change in size and appearance that occurs when you switch from palm-rolling to interlocking. 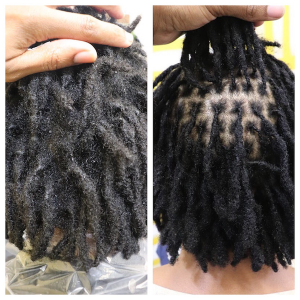 Ultimately, it will be up to you to decide if the benefits of interlocking outweigh the reshaping of the locs for your lifestyle. 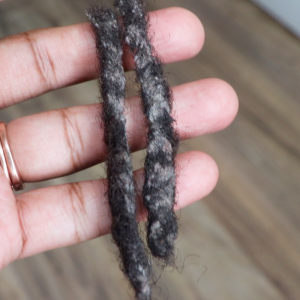 Interested in learning the proper techniques for maintaining your locs with interlocking? Visit NuGrowth Academy and enroll in the “Interlocking Fundamentals” online training. No the size does not have an effect on the timeframe of the hair locking, it depends on hair texture, hair density, product usage and maintenance techniques. I have microlocs very small locks I use interlocking method however my locks have been popping off can I switch to palm rolling method would this help ? Palm rolling would not help you need to interlock to reinforce the locs. However you may be doing it incorrectly or there are other factors that are causing the thinning (poor product choices, hair color, no moisture, etc.) I would highly recommend the “Interlocking Fundamentals” workshop. This article came along at the perfect time for me – I’m writing this in mid-April, as spring has arrived here in New England. I am fairly active, walking several days a week, using an elliptical trainer, etc, and I know I sweat a LOT in my head during the summer. I’m going to take the advice from this article and the one on the best loc tools and try interlocking my hair just during the warmer end of Spring and in the summer. I’ll be careful not to go too tight, and some of my locs are a little larger than a pencil, so I’ll be extra-careful with those. I like the idea of being able to wash my hair more often and not retwisting every single time I wash.
I’ll report back and let you know how it goes! I’m in the same boat. I started my locks with two strand twists and I believe they are developing “textbook”. But, I’ve recently started working out, and I sweat a lot in my head too. I live in Texas, I love to swim, and I plan on going on vacation where I would be swimming quite a but, and far away from my loctician. I think I’ll interlock just for summer vacation and then biannually or once a quarter after that. But I will get a consultation before making a decision. I’m trying to start my locs next month before I go to do a 6 week graduate program in Mexico. I workout a lot and sweat a lot so I was recommended two strand twists or interlocking when I went to the Loc consultation. Now it’s my choice to choose between them. I asked a bunch of questiOns there and now I have more lol but after my program I was going to stop through Atlanta (out of state for me) and have my cousin retwist via palm rolling. I wanted to know if it was okay? If you started with twists that should be okay, especially if you have traditional sized locs. If you have anything smaller you should stick with interlocking.